“Working in a field hospital is like death,” a surgeon told us two weeks ago in Turkey, where more than two dozen Syrian doctors and other health workers had come for training. As if treating victims of the Syrian Army’s weapon of choice, the barrel bomb, wasn’t enough, they themselves were often victims of those same terrible devices. International law is supposed to protect health workers treating anyone who is sick or wounded. Not in Syria: There, along with bakeries and schools, one of the most dangerous places to be is in a hospital or an ambulance. According to Physicians for Human Rights, more than 560 medical personnel have been killed and 155 medical facilities have been attacked since the conflict began, though based on our interviews these numbers are understated. From the start of the war, the regime of Bashar al-Assad has attacked civilians and obstructed humanitarian relief, including vaccinations for children. It has cut off electricity and clean water to areas controlled by the opposition, punished health workers treating protesters and opposition fighters, and deployed chemical weapons against defenseless fellow Syrians. But things have gotten worse over the past year. The Assad regime has descended to an unprecedented level of barbarism, escalating its use of air power against enormous numbers of civilians. The number of injured, according to the World Health Organization, has risen to 25,000 people per month. The centerpiece of the new strategy has been the barrel bomb, an oil drum filled with explosives, bolts, hardware and scrap metal, usually dropped from a helicopter. The bombs explode with terrific force and breadth, amputating limbs and driving shrapnel throughout the body. One doctor we interviewed was still horrified by the indelible image of a mother and daughter whose bodies were blown apart while their hands remained clasped together. In response to such barbarism, and in defiance of the new strategy, local doctors, supported by a few daring nongovernmental organizations, have set up field hospitals in factories, farms, houses, cultural centers, caves and even chicken coops to provide surgery and other care to the injured. Humanitarian organizations are providing supplies and supporting salaries. The regime has in turn embarked on a brutal campaign to destroy the hospitals and kill their medical staffs. It is using those same barrel bombs and missiles against field hospitals and dozens of other medical outposts, as well as ambulances, in order to deter people from seeking care. On some occasions, when rescue crews arrive at the scene of an attack on a crowded location like a bakery or school, more barrel bombs are dropped to maximize the carnage. When the conflict began, the regime decreed that medical care to any area controlled by the opposition, which included demonstrators as well as armed opponents, was a criminal offense — a position that violated the Geneva Conventions’ declaration that medical personnel and facilities are off-limits. Of the 25 medical staff members we interviewed, six had been arrested and jailed for allegedly providing such care. Now the regime is targeting anyone giving medical care in opposition-run areas. The attacks have driven most physicians out of Syria. 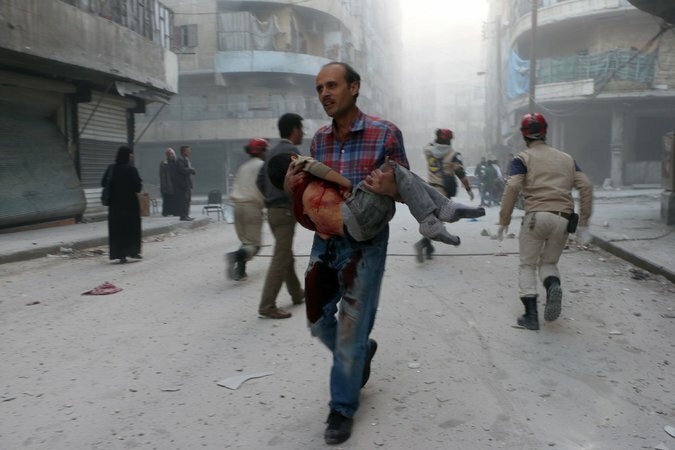 In Aleppo, the largest city in the country, only 13 surgeons remain. And despite efforts of humanitarian groups to supply them with essential supplies and equipment, medical personnel must cope with severe shortages. Doctors and nurses also suffer profoundly, strained by long working days, the horror of the injuries, the impossibly difficult triage decisions forced by lack of resources, and constant danger. One doctor told us that if everyone survived a barrel bombing they did the Dabke, an Arabic dance, in celebration. When we asked the doctors what kind of support they needed, though, they didn’t cite the need for more staff, equipment, rest or psychological support. They asked for one thing: Stop the bombs from raining down so they can treat their patients without fear of death. The United States has the capacity to do that. It can impose a humanitarian buffer zone in northern and southern Syria to allow health care workers to save lives, children to get vaccinated and go to school, refugees to resettle, and relief organizations to do their work. A buffer zone would be enforced by a no-fly zone that would protect the hospitals and civilian areas from aerial attacks. The Obama administration made a great moral and political case for saving the Yazidi people in Iraq and other minorities threatened by the Islamic State, and mobilized an international coalition to do so. How can it now ignore the carnage being inflicted on a far larger group of people in the same region, including caregivers who seek to attend to the complex injuries they have suffered? The brutality of the Assad regime’s tactics at least equals that of the Islamic State. Aleppo itself may soon be under complete siege by regime forces. The Obama administration must affirm America’s leadership role and act to save people under such relentless attack. When work in a field hospital becomes like death, it is difficult to imagine how life has any chance at all. Leonard S. Rubenstein is the director of the Program on Human Rights, Health and Conflict at the Center for Public Health and Human Rights at the Bloomberg School of Public Health, and member of the core faculty at the Berman Institute of Bioethics, both at Johns Hopkins University. M. Zaher Sahloul is a critical care specialist in Chicago and the president of the Syrian American Medical Society. A version of this op-ed appears in print on November 20, 2014, on page A29 of the New York edition with the headline: In Syria, Doctors Are the Next Victims.